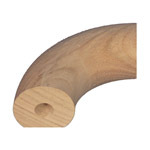 When we first came up with the EZIRAIL continuous timber handrail for stairs 10 years ago, the concept was to produce a simple but stylish round hand rail design that could easily be combined with various angled bends to produce continuous timber hand railing for use in domestic, commercial and aged care applications. The 2.0 is our way of showing the first substantial design change to the range since its original release. • Removing the 40mm Ø bends from the range entirely, although the rail is still available. 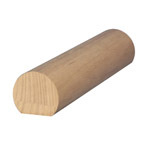 • Changing the design of the 50mm Ø Rail by increasing the flat from 19mm to 32mm. • Totally revamping the range of bends available, so that now all of the bends have a flat on the bottom that matches the handrail exactly. These changes should not only simplify the range, but also improve the overall quality and look. View the full range of EZIRAIL timber handrails, or you can download the catalogue (click on the link below). 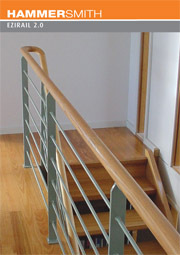 50mm diameter round rail that uses angled bends & other components to create continuous handrail. Perfect for use in aged care facilities where conformity to AS1428.1-2001 is needed.